I HAD A SET WHEN I HAD PEOPLE TO MOVE ME AND THEY GOT GOING. 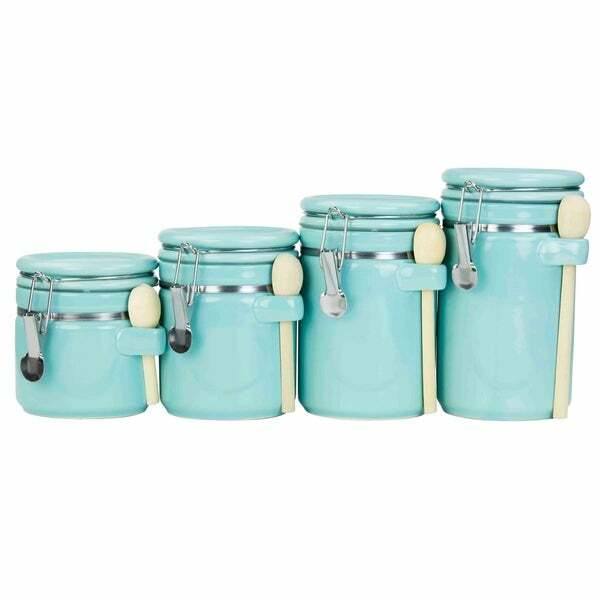 This set features 4 airtight clamp lock canisters with wooden spoons included. Made of durable ceramic. 25oz, 33oz, 40oz, 45oz. Perfect for your countertop storage needs. Great light blue color. Matches perfect with my kitchen set. Highly recommended! However I do wish the spoons were also the same color as canisters, but its still a great product. I really like this canister set. I love the spoon that sits on the side and the color. I do wish maybe they were just a little bit bigger to hold more product. Very pretty! Nice leak-proof seal on canisters too. Only downfall if I’d have to say there was one was I thought they’d be larger capacity. Otherwise I really love them! Nice and just what I wanted. I was looking for a set of cannisters with suction to keep the contents dry at the coast. These will do just fine. Arrived before expected date. Beautiful color. Not quite large enough to hold a whole bag of flour or sugar, but a great size for the counter.